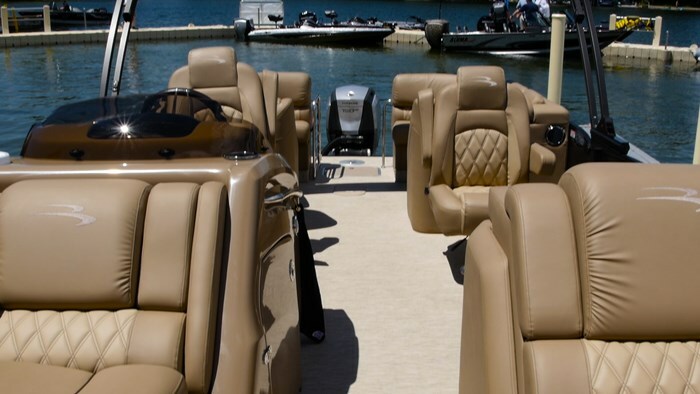 Pontoon boats are now more extravagant than ever. Whenever I am at a boat show I like to sit and people watch and see them react to these new, high end pontoons that are just as nice as luxury cars. They run their hands along the aluminum, they touch the vinyls and sit down in the seats. They look around, trying to imagine themselves out on the water, breeze in their hair and sun on the skin. I can guarantee you that part of that imagery doesn’t include a motor shifting into gear with a loud “kg-kg-kglunk!” and then the captain doing hand over hand turns, trying his might to steer the boat as he docks. The fantasy is then over. The point being that you want your motor to match your boat, not in terms of performance, that is a given. But rather in experience, so when you have a boat as elegant as the 2016 Bennington R23, you need to make sure what you hang on the transom is going to match. 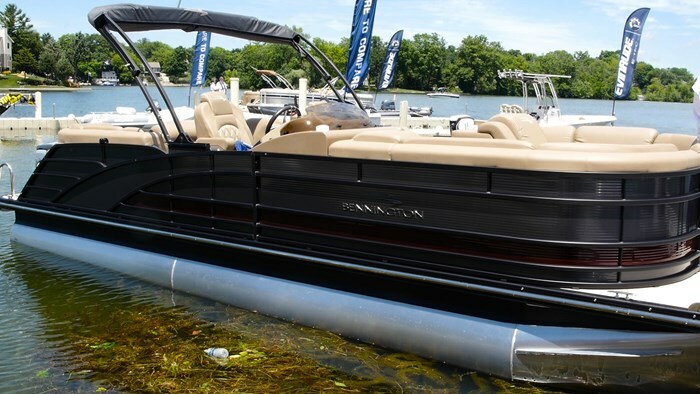 Part of the R Series Performance line, the R23, or R2350 RSFB as it’s more formally known is a sleek and stylish pontoon that’s not meant to just sit pretty, it has some get up and go as well. Each R series comes with Bennington’s Eliptical Sport Package which includes triple pontoons, lifting strakes and under deck skinning. 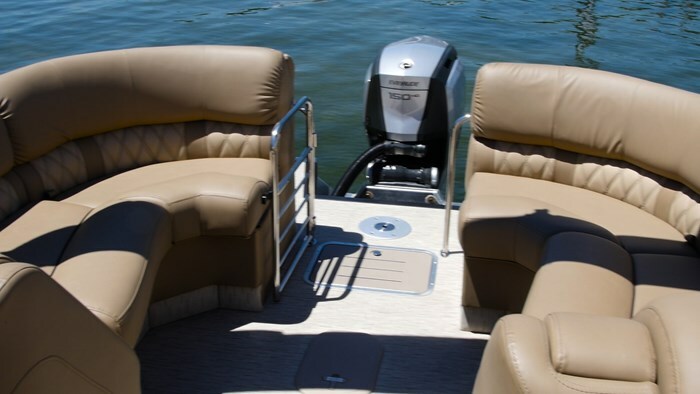 The underdeck skinning isn’t something that gets talked about a lot but it has a huge effect on a pontoon boat’s performance. If you think of a pontoon deck like a wall lying on its side, the cross members are like the wall studs, they create support and structural stability. Without a skin, those cross members are exposed to the water. As water passes around the pontoons, some of it splashes up, hitting the cross members. This can actually create drag and reduce the performance of the boat. So adding the skin creates a smooth surface for the water to deflect against and not interfere with performance. Something exclusive to Bennington is the eliptical center pontoon. Rather than keeping the center pontoon the same shape as the other two, Bennington uses an oversized, 32 inch eliptical shaped center pontoon. This creates a more dynamic running surface which is going to give you higher top speed but also increased cornering and handling - but more on that later. The “FB” in the model designation stands for “Fast Back.” If you’re thinking of the muscle cars of the 70’s when you hear that then you wouldn’t be far off. The RSFB has corrugated aluminum fencing with exterior railings that create eye catching style and curb appeal. At the stern of the boat the railings and gates swoop down aggressively, much like on the old muscle cars. This creates an always in motion appearance, even when the boat is sitting still. The R series is not just about performance, but also it’s all about customization. Right away when you visit the R series on the Bennington website they drive you to the boat builder tool, giving you multiple choices of length - from 23 to 27 feet and layouts. From there you can fine tune your interior options, bells and whistles. The R23 that we spent time with at the Club Evinrude media event was very well appointed. I thought most of the bells and whistles were options but when I looked later at the model page on their website, it turned out most of which were standard. The layout of the R23 was the ever popular twin chaise lounges in the bow, with twin chaise lounges in the stern with twin captain’s chairs mid-ship. If I have seen this layout once I have seen it a thousand times. That’s because that is what customers want, it’s what their buying. But as I started to dig a little deeper on the R23 I started to find some things that really impressed me. The first of which was the change area and head that was under the bow, port-side seat. Normally these are tucked into the backrest of the lounge. The backrest will lift up and the curtain will fold up on hinges. This was not the case with the R23. There happened to be a switch there, so I pressed it and what followed was the ENTIRE PORT LOUNGE started to hinge up on power hydraulic struts. The seat raised until it was 90 degrees in the air, the curtain still hinged up but when up it was an oversized changing area with a full plumbed head. A pretty cool party trick if you ask me! A hard act to follow, but in the starboard lounge an armrest folded down. That I have seen before but what was hidden inside I had not. Bennington includes USB charging stations hidden in the arm rests. I don’t know how many people I see constantly walking around with a charge cord for their cell phone, eager to snag any amount of juice at any opportunity. So while not equal in size to the change area, still equal in functionality and convenience for your guests. The vinyl consisted of Napa Beige Affluence Soft Touch with Tuscan Dune Affluence two tone accenting. I’m not entirely sure I know what that means, but it was as nice as it is fun to say. The helm on the R23 was very well appointed, with a raised stand, a row of rocker switches flanking the tilting wheel and multiple drink holders. Front and center was the large, 7-inch touch screen Evinrude multi-function center, with a Garmin Nav system off to the right. So as you have started to see this is a pretty spectacular boat. It’s well appointed and for those with discriminating tastes. So when it comes to the motor you hang on the back - you want to make sure it matches the stature. This Bennington R23 had Evinrude’s brand new 150-hp HO G2. This motor is the highlight of the expansion of the award winning G2 line from Evinrude first introduced in 2014. When they launched those motors, it was from 200 H.O. up to 300 which is cool and all, but how many of those motors do you see everyday? 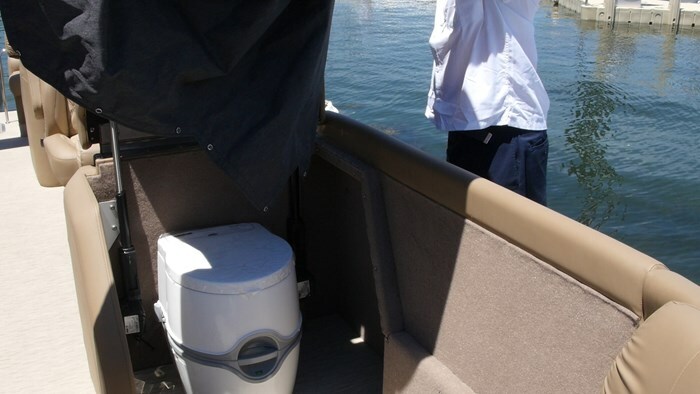 So by lowering the horsepower on the motor but keeping the hallmark technology the same, they’re making these outboard accessible to the masses. Some of these hallmarks include built in power assist steering, digital shift and throttle for smooth operation, iTrim - an automatic trim function and minimal maintenance. 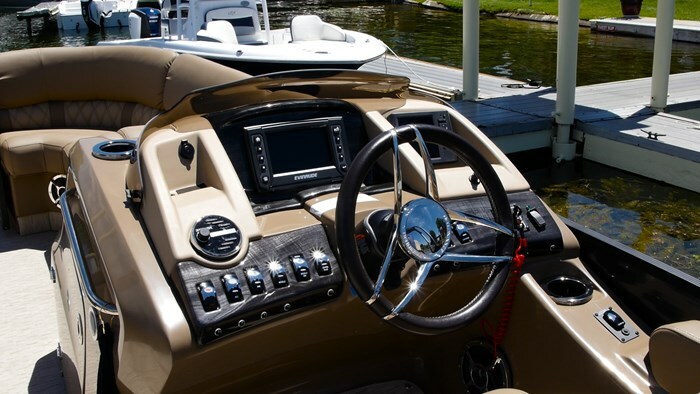 All of these things add up to an exceptional boating experience. Now I talked earlier about Bennington’s exclusive Eliptical Sport Package and I was pretty pumped because this was the first time I was able get my hands on it and we had a perfect day for it. The tough life of a professional boat tester means we usually test boats mid-week. The water is usually calm and there is barely anyone out on the water. While this is great, it doesn’t always paint a true picture of a typical day of boating. But on this day, it was a beautiful late June Sunday on a busy lake in Wisconsin. The boaters were swarming like mosquitoes and subsequently the lake was a soup bowl tossed around. Now this was perfect boat testing conditions. One of the things these new G2’s boast is best in class torque and when I put the throttle down it was evident that was the case. At a weight of around 3000 pounds plus people, this was a big package for the 150 Evinrude to handle and I was really quite impressed with how it performed right from the start. Normally a 150 would struggle with this but not the case at all as we were on plane in under 4 seconds. Having the added benefit of power assist steering and iTrim was a beautiful luxury. Both of which come in handy in times you wouldn’t immediately think of. Of course on a busy day there are going to be boaters and eventually one is going to cross your path. If you have to make an evasive move the power steering allows you to do so effortlessly and the iTrim will automatically put your trim down to avoid cavitation so you can keep both hands on the wheels and your eyes towards open water. When you steer back on course your iTrim will recover and you will be rocking and rolling again. Speaking of which that’s exactly what this boat was doing. With 3 people on board we easily cruised in the 20-mph range and 30-mph wasn’t an issue at all. With 2 people on board the Bennington R23 with the Evinrude G2 150-hp HO will hit a top speed of 41.5 mph at wide open throttle. That’s quite impressive. Again I was also impressed how well the Eliptical Sport Package handled rough water. I’ve put pontoon boats through some pretty serious testing, including entering one into a high speed poker run and to this day I will always argue that a 23 - 25-foot pontoon is the best rough water handling boat out there and the Bennington R23 was proving me right! You wouldn’t buy a luxury car with crank windows and manual locks or with rack & pinion steering, so why would you have a luxury boat with out of date technology? I love the high tech features of the G2 and when put on a boat like the Bennington R23 then you have an incredible boat package.